For the sufferer, foot eczema can be painful and a big source of discomfort. Eczema on your feet tends to occur predominately between the toes, the heel, and the ball part of the foot. Though it can appear on any part. When the skin becomes cracked and dry, an infection can occur. The symptoms will become worse. The skin will become more inflamed, wet, and be harder to clear and manage. The symptoms can look a lot like Athletes Foot. Athletes foot is red and itchy. It is common between the toes. The symptoms are the only similarity between them. Athletes foot is contagious. It is caused by a fungal infection that loves warm, moist places to grow. The treatment is completely different too. This is why it is very important to get the right diagnosis. If you try to treat whichever condition you have yourself it could be made worse. If mild, treating your foot eczema can be relatively easy. It is important to keep your skin moisturised. So the best way to manage your eczema is to use an emollient. It helps to keep the skin supple. This prevents your skin breaking, so reducing the chance of an infection occurring. You can also use a topical steroid. They help to reduce inflammation, so reducing itching. If an infection does occur then you may be prescribed either topical or oral antibiotics. They will kill the bacteria causing the infection. Using alongside an emollient and/or a topical steroid can help to clear a flare up. Using any creams or ointments on your feet can pose a few issues. Because we can be on our feet for a great deal of time we need to set some time aside to apply the creams. This is to allow time for the cream to absorb into the skin. If you are limited on time, you could wrap a bandage around the affected area, after the cream has been applied. This can stop the cream rubbing off on your shoes or socks. If your foot eczema is severe, then your doctor may recommend you try light therapy. Though not all doctors will suggest it. As well as using conventional treatment, there are also some things you can do yourself. Use an occlusive dressing. These are especially useful at night, when most people find their eczema itchier. Apply your eczema cream to your feet. Wrap your feet in bandages. This will help with the absorption of the cream, and also makes it a lot harder for you to scratch! If you have a good self management plan, and look after your skin well, then your foot eczema shouldn’t cause you too much discomfort. 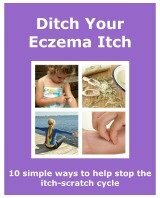 But we all know that sometimes eczema just seems to flare up for no reason that we can see. If your eczema is causing you a lot of pain or isn’t clearing, visit your doctor or dermatologist.